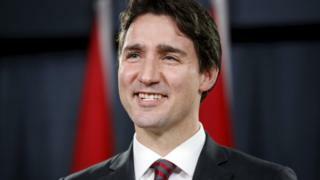 Image caption Prime Minister Justin Trudeau is described as a "world leader with a heart"
Canada is now hip, according to the New York Times. In what can only be described as a back-handed compliment, the NYT declared in a recent style article that its neighbour to the north was no longer a "frozen cultural wasteland populated with hopelessly unstylish citizens". The reason for Canada's sudden cultural cachet? The Times mentions film and music idols, fashion designers and YouTubers, but the star of the show seems to be new Prime Minister Justin Trudeau. The "6-foot-2 self-described feminist... has assumed the role of world leader with a heart," reckons the paper. But the Times is not exactly thought of as being at the cutting edge of popular culture. The Grey Lady, as the paper is affectionately known, is even mocked by a dedicated spoof Twitter account for arriving consistently late to the zeitgeist. And Canadians who tweet (those left who haven't moved on to more hip social networks, presumably) have been sending the paper (and themselves) up over its ever-so-slightly patronising article. Who is Justin Trudeau, Canada's next prime minister?